Like, they had a birthday. 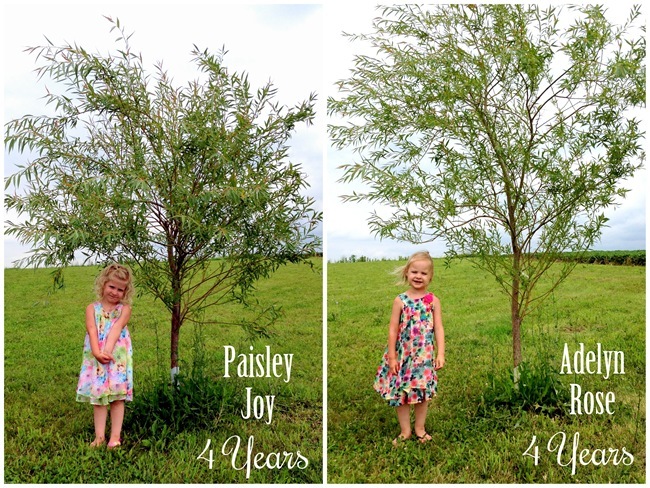 And now they’re 4. And I’m a mother to four-year-olds. And soon they’ll be asking to wear deodorant. And then they’ll move out and I’m ugly-crying right now. 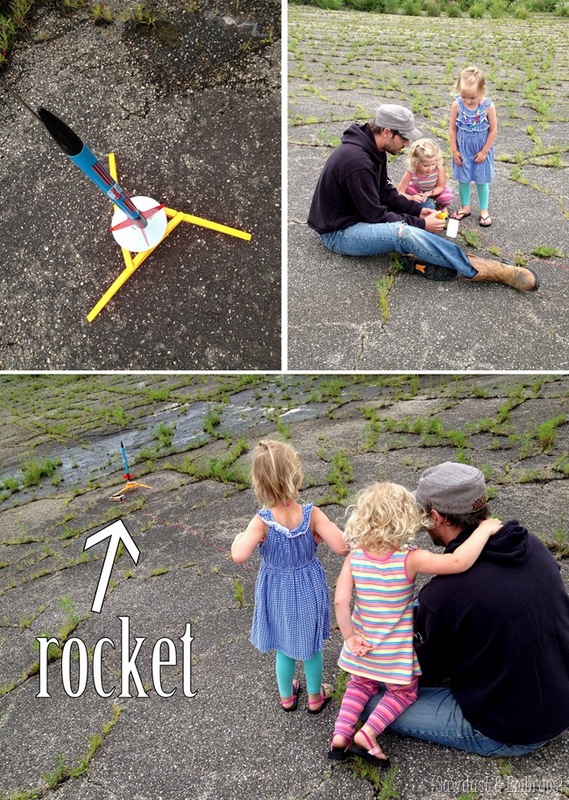 Among a few other (small-ish) things, Nick felt it was important for the girls to have a rocket for their birthday. Naturally. I took video of the rocket launch the first 5 times WHEN IT MALFUNCTIONED. And the time that it actually worked, I was nowhere to be found. Oopsy! Mommy missed out. But the girls absolutely LOVED it. Sidenote, it’s hilarious to hear a 4-year-old say ‘asphalt’. 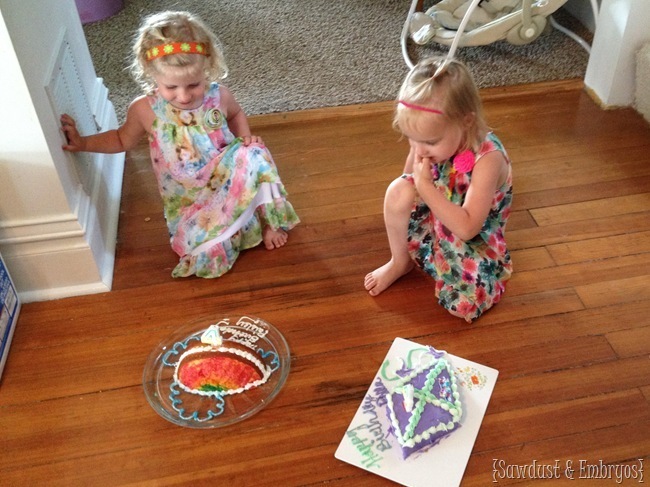 The girls may have to share a birthday, but they can each have their own cake… RIGHT?! I asked each girl what kind of cake they wanted. 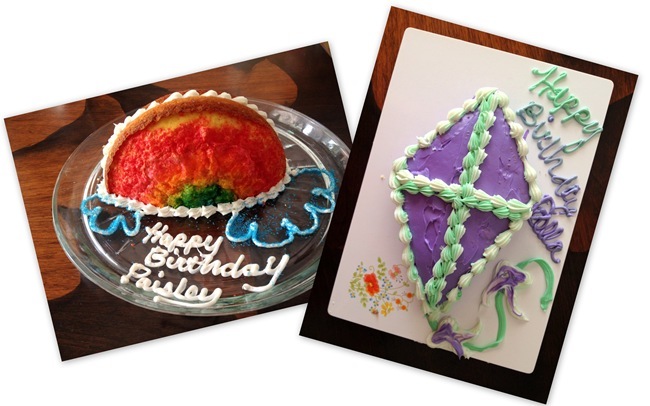 Della wanted a ‘kite’ cake, and Paisley wanted a rainbow cake with no frosting. Obviously I could brush up on my cake decorating skills. But I put in a valiant effort. When Paisley asked for a ‘rainbow cake’, I’m guessing she meant like this cake… but I just couldn’t bring myself to make another one of those. Instead, in a round cake pan, I sprinkled colored sugar sprinkles right onto the cake batter in a circle ROYGBIV from the outside to the inside and then baked. It made for a yummy crispy effect! And she loved it! I sat down with the girls and asked them a series of questions just to document their cute little answers. Pretty hilarious if I do say so myself. And it will be so fun to look at in the years to come! 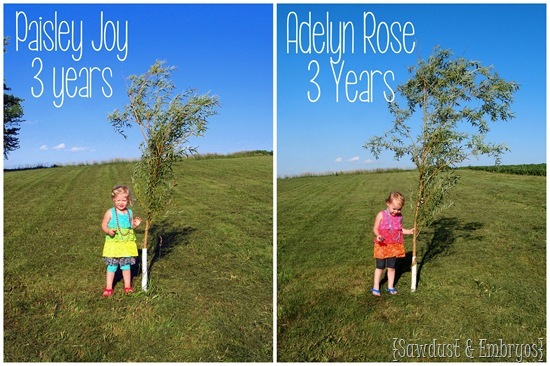 Each year, we take a photo of the girls with their very own willow tree that we planted the year they were born. It’s so fun to see how much they change each year! BOY HAVE THEY GROWN! Both the girls and the trees! 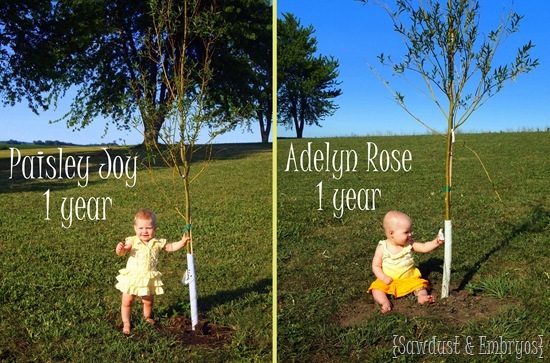 We have a tree all picked out for Cypress (and it’s not a Cypress tree, believe it or not) to plant this fall. We still haven’t decided where on our acreage to put it. Stay tuned! 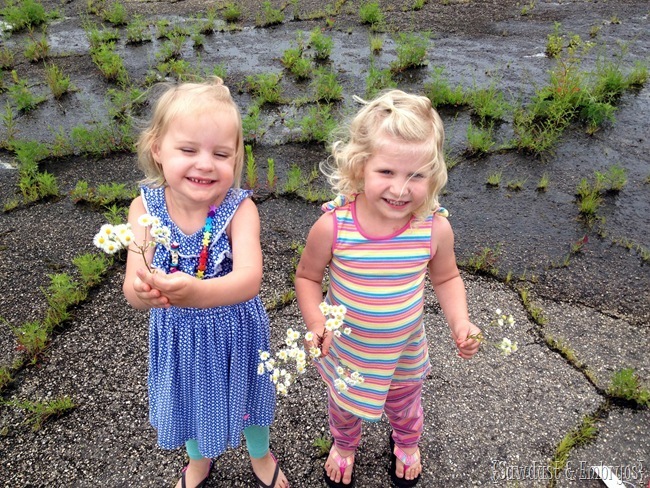 We’re taking one year at a time with regards to have we celebrate their double-birthday. If you have twins, do you celebrate their birthdays on the same day? Or do you designate a day just for them close to their actual birthday? Do you have separate cakes? Sing two birthday songs? I’m so very curious! Two 3-year-olds, and 6 weeks gestation! 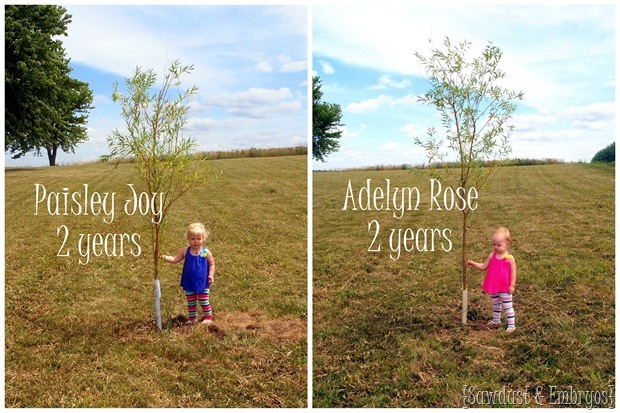 Planting Willows – One for each babe! I don’t have twins but my sister does. They always get their own cake but celebrate the same day. One year, they had 2 themes. One was into Hello Kitty, the other Dr. Who….everything was totally separate but yet together. The girls LOVED it but It was crazy and my sister said never again! LOL! I love the idea of making a cake for each girl, but celebrating the same day. While I’m not a twin, one of my older brother’s birthdays fell the day before mine (we are 13 years apart) and we were often made to celebrate the same day and share one cake. I have twin girls who are now 14 years old. I also have an 18 year old daughter who is leaving for college in about a month (we are all feeling excited but a little sad too). We’ve always celebrated the twins birthday on the same day. They each get their own cake and get to choose the flavor and kind of frosting they prefer. We hold a joint party for them and they get to choose the friends that are there. Because they have a January birthday some years we’ve opted to wait and celebrate in the summer so they can have a pool party with their friends. 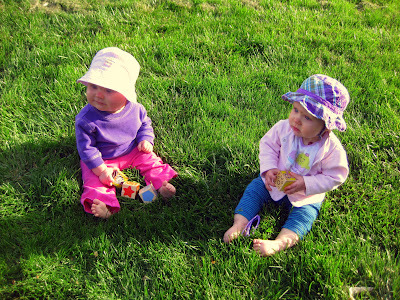 It’s hard not to look back and worry that hopefully I’ve honored their “twin-ness” and separate identities in a way that feels right to them. Happy birthday to your precious daughters! Their answers to your questions were great, especially about your job! Happy Birthday to this adorable girls. I love the questions and answers and the pictures are amazing! They certainly have grown! Thanks for sharing them with us! Happy Birthday to the girls! And nice job on their cakes. I like your Q&A’s for the girls. You might like the Question a Day for kids journal (look on Amazon). It works for a wide range of ages- my 13 year old is actually doing it, but in the reviews people are doing it with 4 year olds too. The responses to the questions are adorable, I loved reading them! 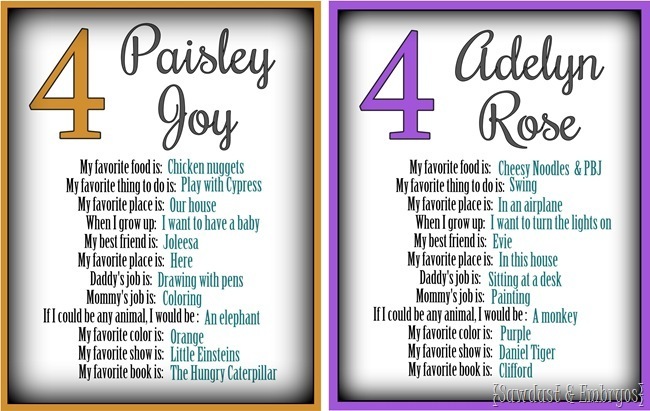 Happy Birthday Paisley and Adeline! You look so grown up. Macy and Peyton will be 4 the day after Christmas, so we have the problem of trying to make their birthday special during the biggest holiday our family celebrates. 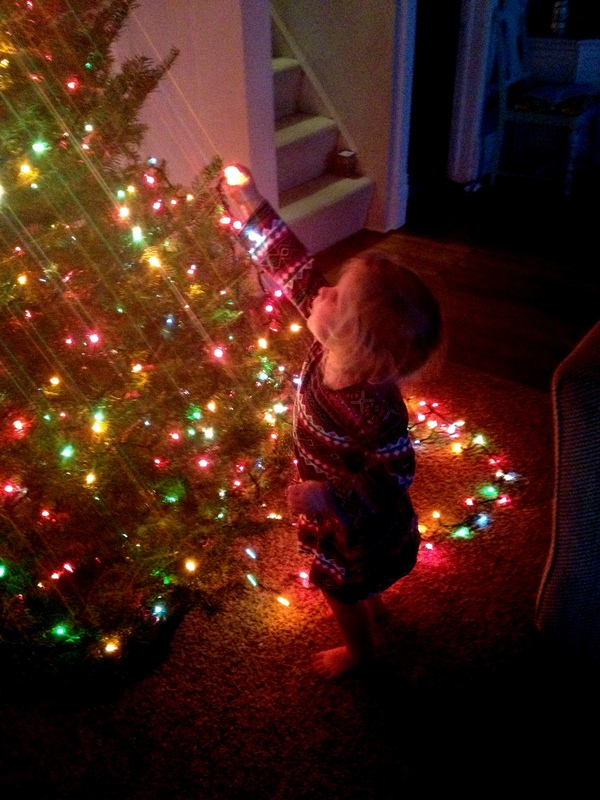 How can I possibly compare to Jesus’ birthday, Santa, presents and holiday food?! Impossible! What we have done the last 2 years is have their birthday celebration a couple weeks before Christmas to separate the two events. We have their big family/friends party and have made them their own cakes 2 out of the 3 birthdays we’ve had. We did a “Tea for Two” party for their 2nd (two as in “two years old” and two as in “twins”) where we just make different sizes of cupcakes. Their 1st and 3rd birthdays they had their own cakes, but they were different colors to suit the individual girl. I sense a problem brewing for the future, though… Macy is already saying she wants a Rapunzel party and Peyton is saying she wants a Cinderella party… So there’s that. Not to mention the fact that when they get to school-age and want to invite their friends to a party, many will be on Christmas vacation, may not be available for a party, or parents don’t want to bring them and have to bring a present so close to Christmas. I have thought about doing half-birthday celebrations in the summer so they can have a fun party, but that’s years to come still. This twin adventure is something else, isn’t it? The cakes are lovely and the girls are beautiful! The girls are so cute! We have twin boys who are 7 and so far we have celebrated on the same day. They seems to prefer it that way. I make them their own cakes. I figure if they were born on separate days, I’d make them each their own, so they get their own even though they we celebrate all in one day. I usually take one cake and put it in two pans so they can each have their own cake and we don’t have more than we can eat. We also sing the birthday song twice, once for each boy, I don’t know how that will all change in the future, but that’s how we’ve done it so far! I love your perspective on doing one cake for each child!